When it came time to introduce foods to my son it made me very emotional. I was surprised at my strong reaction as I didn’t think this milestone would affect me so profoundly, but the fact of the matter is it did. For me, it was the first of many experiences where my son was becoming more independent. I also really enjoyed our time breastfeeding together. Although I knew that nursing him would continue, our relationship was changing. Going back to work didn’t even affect me as much- It’s odd I know! When? 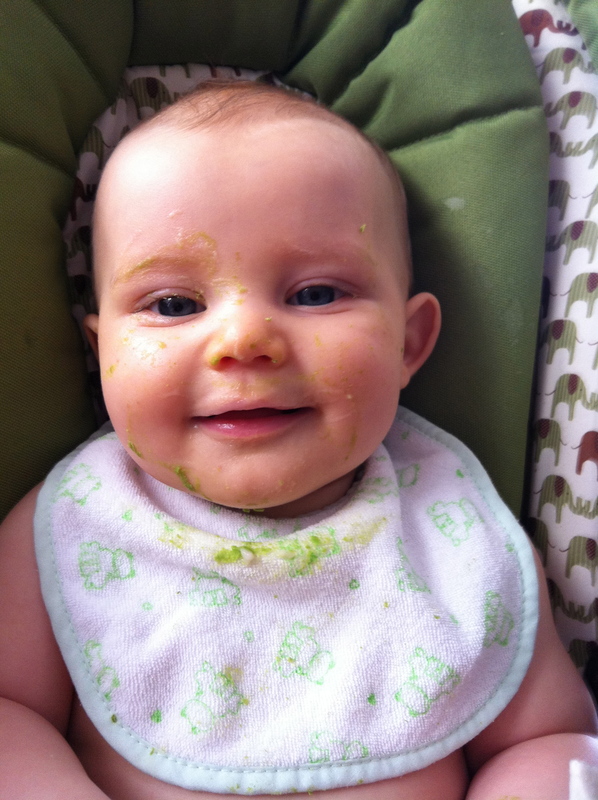 The major reason for food introduction at 6 months is your baby’s nutritional requirements change significantly. Foods can be introduced as early as 4-5 months, although it may be best to wait until at least 5 months to ensure that they can digest food properly. Does your baby watch while you eat? Your baby may be ready. The ability to sit in a highchair and pick up food with their thumb and forefinger are also signs of readiness. A good rule of thumb is that if they are reaching for it they are probably ready. What to eat? You want to select foods that are the least allergenic and easily digestible. Contrary to popular belief I do not think that iron fortified grains (ie. rice cereals) are a great introductory food. It is advisable to begin with certain organic fruits and vegetables. The need for iron substantially increases at the 6 month mark therefore selecting foods that provide adequate iron is of utmost importance. With growing concerns of food sensitivities you need to know how to introduce foods in such a way to ensure that they can be identified and avoided to prevent further discomfort for your baby. Continue to nurse or formula feed your baby during this process. 6-9 months- Root vegetables such as sweet potatoes, carrots, squash and beets. Fruits such as pear, apple, avocado and banana. 9-12 months- oatmeal, quinoa, egg yolk, beans, pureed meats. 12 months and beyond- wheat, nut butters, whole egg, goat’s milk before dairy milk (structurally more similar to breast milk). DO NOT feed your baby honey, you must wait to over 12 months to introduce. Select one food at a time every four days. This way you can observe your baby to see if there is a sensitivity and you do not have to question which food it was that is causing problems. Peel the skins as these are too fibrous and will be difficult for your baby to digest. Lightly steam your vegetables to soften and be sure to include the water used to make your puree. Make your purees very smooth for initial introduction. The consistency can become more thick and chunky as your child matures, preparing them for solid food. Feed your baby small meals 2-3 teaspoons 1-2 times per day for the first 6- 9 months and increase meal frequency and portion size as they grow. Add herbs and spices to your purees such as dill, parsley, basil, cinnamon and cumin. This develops a diverse palate, making them more open to different foods as they grow. I would add herbs and spices after you have completed individual fruit & veggie introduction. This way if your baby has an adverse reaction you will be able to identify which ingredient your baby is sensitive to. Go into food introduction with an open mind. They may love it, hate it or simply might not be ready. Listen to their cues and respect what they are telling you. If they are not interested initially give it a week or so and try again. They will let you know when they are ready! Most of all take the time to introduce the foods properly and enjoy the process as you establish your child’s healthy relationship with food!